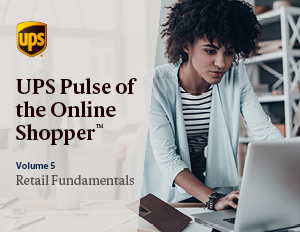 This is the final volume of the 6th annual UPS Pulse of the Online Shopper™ Study. Developed in partnership with comScore and Astound Commerce, this study is designed to provide insights into online shoppers’ behaviors and preferences. Exceptional customer service is more important than ever and top-performing retailers do all they can to leverage service features to differentiate their brand. Get insights into what elements of an effective customer service offering matter most for online shoppers. The best retail players are expanding service options and delivery capabilities to meet customer demands and remain competitive. Learn about the preferences of online shoppers around key features in the delivery and logistics experience. Returns processes and policies are top of mind for omni-channel shoppers prior to making a purchase. Recognizing this factor in the overall shopping experience, top retailers are implementing new processes and policies that have made returns simpler and easier. Discover shopper behavior around online returns and their preferences for a satisfying and effective customer experience. You will receive your download shortly.